Since I've been worrying about posting too many wintery contents on my blog — and, uhhh, I'm still not done with them — I guess I could compensate with a splash of bright colour to make it feel a little spring-y...right? Lemme just apologise in advance if that shade of yellow makes you want to jump straight into summer though, oops. 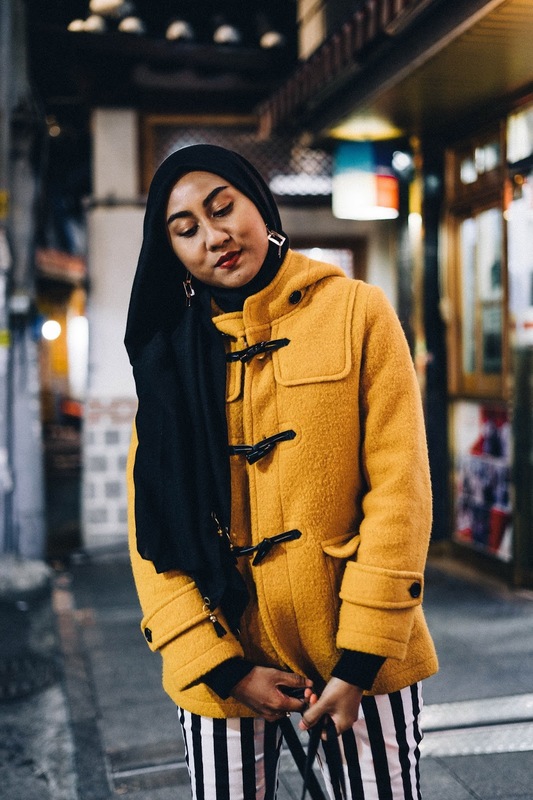 I travelled quite a bit during winter this year so I got the rare opportunity to re-wear a lot of my relatively unused winter jackets, including this mustard yellow one I bought way back in 2015 in Ginza, Tokyo. 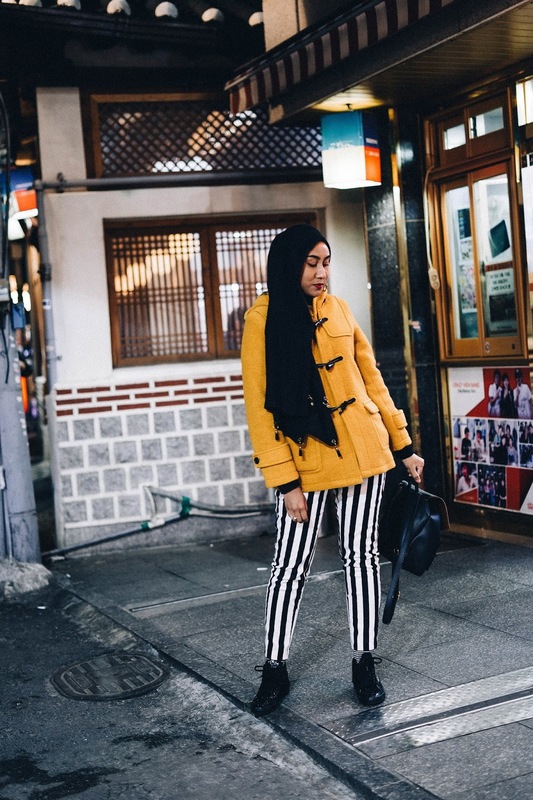 I was ridiculously looking forward to wearing the yellow jacket with my "Beetlejuice" pants in Seoul again after I first discovered I'm seriouly into the yellow-black-white combo on my first trip there. Dressing up really has this weird effect of making me excited and happy, I can't help it — does that ever happen to you? 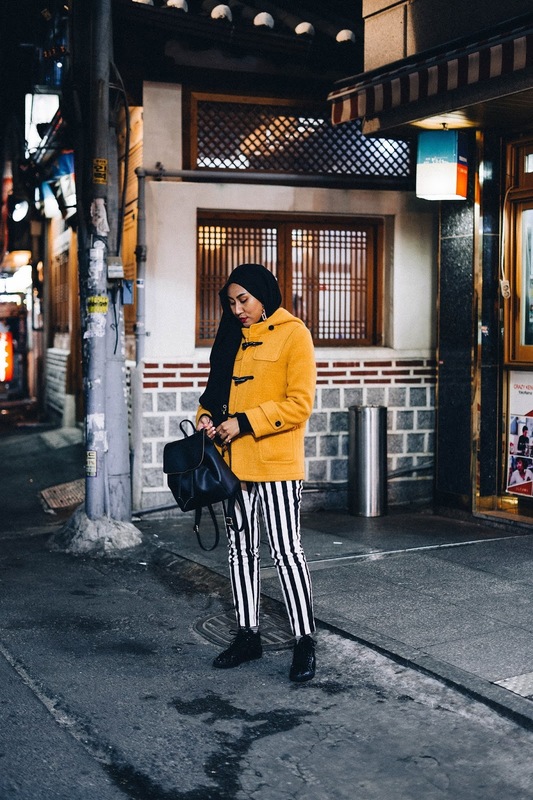 I have another yellow-black-white Seoul outfit combo coming up (toldja I am FEELING it), can't wait to share with you guysss. Thank you, Judy! I MUST try to incorporate more of this mustard shade into my closet now that you said it looks good on ME. 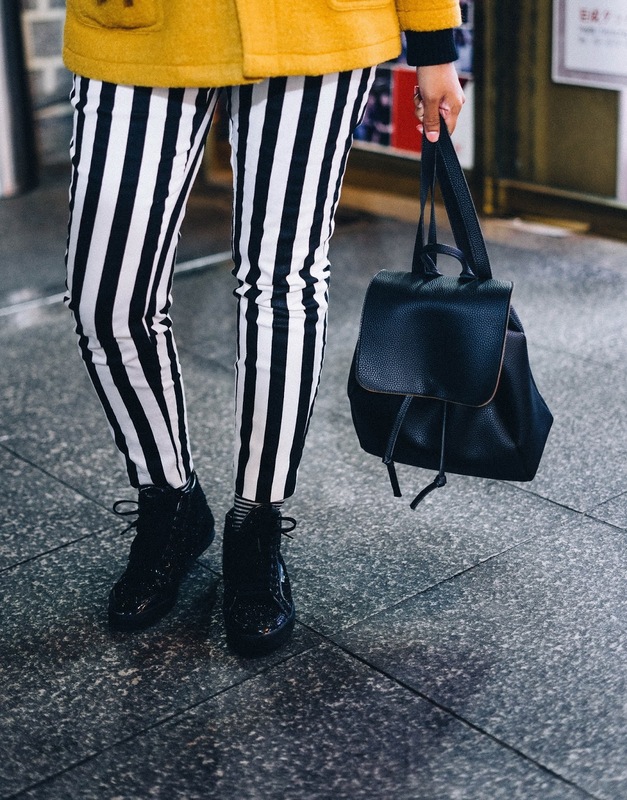 It does match the black-and-white stripes well, doesn't it? PS: I have to confess, I had to check what "grommet" means in Merriam-Webster, thank you for teaching me a new word! 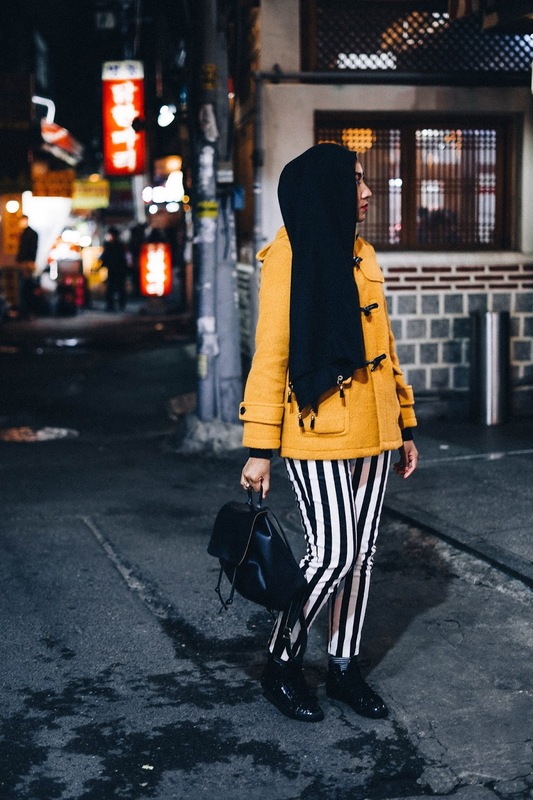 My other yellow-black-white outfit isn't exactly summer-friendly, but it's friendly-ER than this, I guess...? But anyway even my regular Malaysia outfits can hardly be called "summer-friendly", I always wear my outfits with the idea that I could pop into air-conditioned places at any given moment. I love this coat too, I hope I get to experience winter again soon just so that I could re-wear it! You're right, it hasn't been raining much here, has it? Ahhh well. The coat is so cute, and looks so comfy!! Love this! Ahh I used to have pants like that and I got rid of them - I regret it to this day! I love the way you've styled them with the yellow! Hi Katia! I loveee the black and white with yellow, too. Oh nooo, I would be pretty bummed too if I don't have these pants in my closet anymore. I do hope you find a similar pair to replace it soon!